I think I just discovered that my family has ties to New York City. Now before you close your browser window and write me off as being too dramatic, allow me to give you some background on my family. My mom’s family, the Happs, are very passionate people, and if there is one thing that we Happs are passionate about, it’s who we are and where we come from. And that “where” is southeast Pennsylvania. As far as the Happs are concerned, the center of the universe is Doylestown, Pennsylvania, the best (and worst) professional sports teams are the Eagles and Phillies, hoagies are a gift from God, Yuengling should available at all family functions, and when we say “the City,” we mean Philadelphia. There is also one other minute ideology that most of the Happ family subscribes to: a severe dislike for New York City and everything that goes with it – the people, the overall “vibe,” and especially the sports teams. 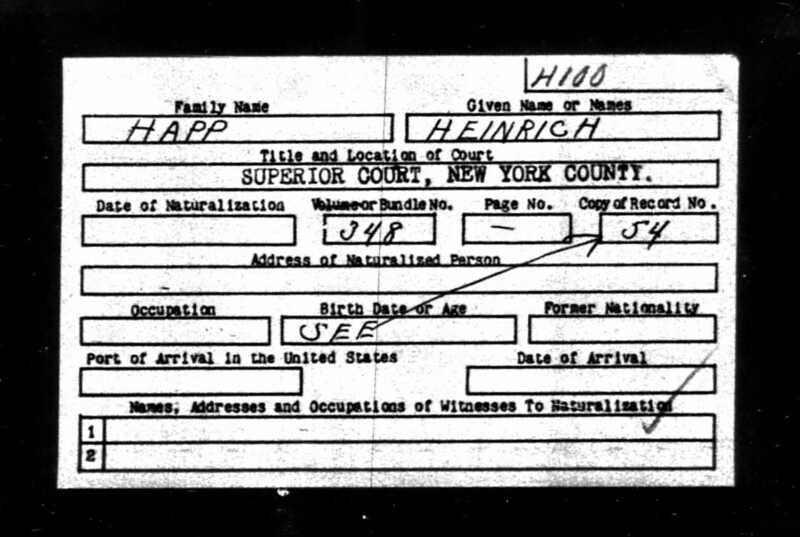 This is why, when I learned that the Happ family immigrant ancestor, Heinrich Happ, not only possibly arrived and was naturalized but also lived in New York City for a few years, I had a bit of an identity crisis. I had always been told that Heinrich left Bavaria and came to Philadelphia, where he lived, married, and eventually moved to Doylestown; the Happ family has been there ever since. But this new piece of information, the possibility that Heinrich came into New York rather than Philadelphia, is a bit of a game changer. I have put in a request to receive Heinrich’s naturalization record from New York City. On the one hand, I am hoping that I have found the wrong Heinrich Happ and that my family’s Heinrich actually did come into the United States via Philadelphia. On the other hand, from a genealogist’s perspective, I really hope that this is the correct Heinrich. So here is the $100,000 question: do I tell my family? Well, the answer is, of course I am going to tell my family. New York City was a completely different place when Heinrich arrived in the 1880s (after all, those despicable Mets didn’t start “playing” baseball until the 1960s), and although my family does not like New York City, they are always open to learning more about the Happ family history. But this got me thinking – is there a “code of ethics” to genealogy? Sure, finding out that the Happs have a connection to New York City is not exactly the biggest bombshell in the world, but what if I were to uncover something a bit more scandalous or even disturbing about one of my ancestors? What if I discover some piece of information that contradicts what my family has always known (or thought) about our ancestry? Or are there secrets that were made, and kept, by past generations meant to be kept in the past? I suppose there really isn’t one general answer to these questions. Every family is different, and every piece of information discovered about an ancestor may have a different effect on family members. Personally, for now, I am going to go on a case-by-case basis when it comes to learning new information about my ancestry. As I had mentioned earlier, I am going to tell my family about this sticky New York City situation. But to err on the side of caution, I think I’m going to wait until I’m actually sitting at the Thanksgiving dinner table to tell them the bad news. You raise a good question. I believe every family has a skeleton or two in its closet–family history is not for the faint of heart or those who want to keep their fantasies intact! I record these, but I may not tell some family members. It depends…. Clever hook and entertaining reading, Laura. Thanks! I too have found that the stories my family tells are not always supported by the documents. For example, the brave Union soldier in the Civil War actually deserted before ever firing a shot. Or the house that great grandfather built from a Revolutionary War land grant was really only purchased less than one hundred years ago. It’s fun, and sometimes shocking, to learn the truth. And good luck with Thanksgiving dinner this year. Maybe what happens there will make for another post? I think it is a case by case type of thing. One family member might want to know everything you find; another might want to know only if someone famous was tied to the family tree (er, so to speak); and still others might not be interested at all. My family falls mostly in the third category so this isn’t an issue for me as yet. Ha. I had a few chuckles with your “code of ethics” story. My brick wall may have a skeleton in it. None of the family members know anything about our g-grandmother, Mary Jane Young b.9 May 1867 in Wales d. 21 Apr 1951- West Side Hospital, Scranton, Lackawanna, PA. She married William Phillips b.5 Oct 1863 d.4 Mar 1938 So. Abington, Lackawanna, PA. I sent for her death certificate hoping to find the names of her parents but it only said William Young was her father and nothing about her mother. I thought of Mary Jane Young when reading your “code of ethics” story which I enjoyed very much. I will keep digging and one of these days I hope to find something to report to my family about our Mary Jane Young. I am working on a DVD for my mother’s side. My family enjoys hearing what I find. I tell them “the fun is in the hunt”! Yes there is a code of Ethics. 1.Promote a coherent, truthful approach to genealogy, family history and local history. 2.Present research results and opinions in a clear, well-organized manner; fully and accurately cite references; and refrain from withholding, suppressing, or knowingly misquoting or misinterpreting sources or data. 3.Promote the trust and security of genealogical consumers. 4.Advertise services and credentials honestly, avoiding the use of misleading or exaggerated representations; explain without concealment or misrepresentation all fees, charges, and payment structures; abide by agreements regarding project scope, number of hours, and deadlines and reporting schedules; keep adequate, accessible records of financial and project-specific contacts with the consumer; and refrain from knowingly violating or encouraging others to violate laws and regulations concerning copyright, right to privacy, business finances, or other pertinent subjects. 5.Support initiatives that preserve public records and access to them. 6.Be courteous to research facility personnel and treat records with care and respect; support efforts to locate, collect, and preserve the records by compiling, cataloging, reproducing, and indexing documents; refrain from mutilating, rearranging, or removing from their proper custodians printed, original, microfilmed, or electronic records. 7.Promote the welfare of the genealogical community. 8.Give proper credit to those who supply information and provide assistance; refrain from (or avoid) knowingly soliciting established clients of another researcher; encourage applicable education, accreditation, and certification; and refrain from public behavior, oral remarks or written communications that defame the profession, individual genealogists, or the Association of Professional Genealogists. Go ahead and tell your family the “bad” news! When we went to one of my wife’s reunions and told them that their oldest known ancestor wasn’t who they though he was; and showed them documented proof of that fact, you’d have thought we brought some of them the bubonic plague! The information was readily available at a local courthouse in a will and later in deeds and other information there too. My criteria for telling about the skeleton in the closet – or not- is “Will someone who is still living be hurt if I tell this secret?” I will record the negative information and its source in my notes, but telling others may be selective. Who gets told what HAS to be selective, an exercise in prudential judgement on our parts. ALL families have “secrets”, very very often of the “Dear Ann Landers” variety if not actually criminal in nature. Both a family as a unit and its individuals live within their own “bubbles” as a way of functioning with the known or sensed “secret”, whatever it might be. If the current family nexus you are working with (say grandparents, parents, children) are making do quite well with the “happy face” persona, it is not our role to instigate “interventions” by piercing those bubbles. Am I always looking for the grit of relationships when writing a genbio sketch? Yes, as its THAT which really brings people to life as real characters. But always writing it up? No. Preserve the source material, if possible, especially if its a source such as a still privately held diary (in which you are reading only one side of the story, of course). Certainly preserve the content. Then leave it up to a future historian as how to use it. Personally, I am much much less selective regarding public, official records. Hiding a living person’s name on an Ancestry tree, when Ancestry itself is aggregating every record by which I can identify that person so as to sell you a better product, is ridiculous. The first paragraph refers to oral (especially) or written information still in family hands involving people who are still living, even if the creators of those documents are well dead. Recognize the bubble, respect it (we are not therapists), get the basics correct, save everything, and move on. 1) Enter the truth in your written records and make someone who values truth the recipient of your work when you can no longer care for it. 2) Decide whether the truth will hurt people deeply or help them to understand who they are. I have found witches, one hanged, others had various ends, army deserters. For me, I’m embracing the witch discovery by writing a paper on the phenomenon from the family’s perspective. I don’t have close relatives to shock though, so that may make a difference, but I doubt it. Hey, there’s nothing wrong with New York!! LAURA, this was a delight to read and brought a smile to my face. Thank you! I’m going to forward it to my husband’s Philadelphia relatives, all of whom believe they have lived there forever. I agree with Lethene . If someone living will be hurt by the new information, it’s not worth it. Goodness knows many of my relatives are bored to death by my ramblings, no point in hurting their feelings as well. But I will record the correct data, just not broadcast it widely. My information was not about criminals or witches etc. But rather that my namesake ancestor was born out of wedlock and took his mother’s name, not knowing his fathers, so in essence we are not Plasse’s. My 93 year old Aunt would have trouble taking that in. As a police detective I have access to old arrest records. My ancestors all lived in the city where I have worked for about 35 years so, as a matter of course, I checked all of my ancestors for arrest records. I was very surprised that the only record I found was for my grandfather. In 1942 he was “arrested” for a minor hit-and-run and he was fingerprinted and photographed. His mugshot, at 30-years old, is the earliest photo I have of him. So I was faced with the dilemma of showing, or not showing the find. I opted to show the find but (with a big BUT), I attributed as being taken for a hack (cabbie) license. So, my mom gets to see it, but doesn’t know the circumstance. She was only 2 y.o. in 1942 and probably has no idea of the incident. I see no need to tell her.